Great Divide has been brewing tasty beer in Denver, Co since 1994, and now distributes their products across the country. One of the features of many of Great Divide’s beers is barrel aging, where the beer is moved to wooden barrels after initial fermentation and before bottling/kegging. This technique has been used for years for wine and spirits, most of the distinct flavors of whiskey come from the barrels the spirit is aged in. While wooden barrels were used for the storage and transportation of beer since the beginning of brewing, this fell out of style with the use of metal kegs that were easier to clean and cheaper. Craft brewing has re-established the use of wooden barrels to age beer, even using barrels that previously aged wine or spirits to impart subtle hints of these flavors into the finished beer. 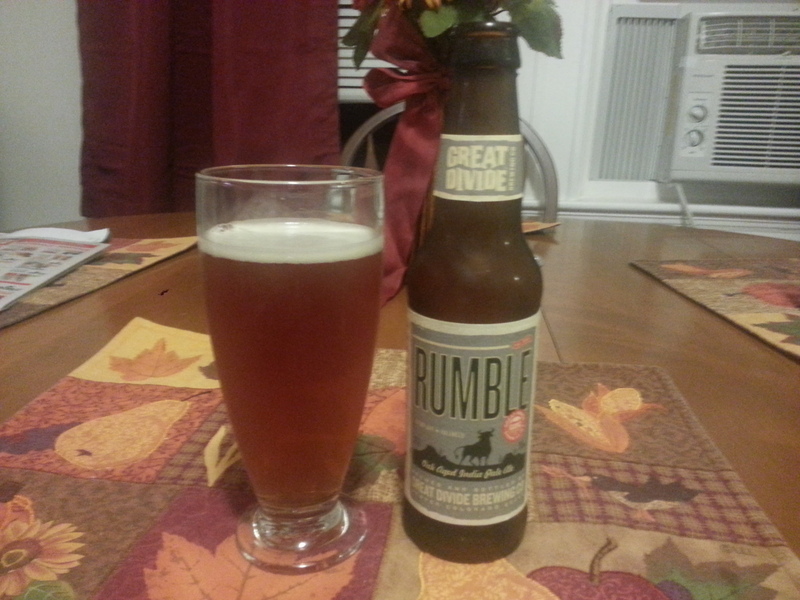 Great Divide’s Rumble is an IPA aged in oak. Oak has a distinct flavor that wine fans should know, American chardonnay’s are often aged in oak and get some of their distinct flavors from the wood. I understand the advantages to aging imperial stouts, barleywines and other high alcohol beers, the fermentations of these beers can create some harsh flavors and the aging process can mellow these flavors and leave a better final product, and aging in wood can add nuanced character to the beer. Aging an IPA seemed counter-intuitive to me, one of the best parts of IPA’s is the distinct hoppy smell, but the volatile chemicals that give this aroma dissipate over time, which is why IPA’s are best when they are very fresh. That being said, I am always up for trying something new, so I thought I would give Rumble a shot. Great Divide Rumble pours a clear amber with a light, white head. The smell is lightly hoppy, some earthy and grassy notes along with the distinct smell of oak. The taste is solidly bitter with a full malt backbone, caramel with hints of butter and vanilla. The oak is also very present in the taste, you taste the wood and a little bourbon character. This beer is more a sipper, which is probably just as well at 7.1% ABV. Personally I would rather have a fresh IPA that smelled like floral and citrus, but if you like the strong wood flavors infused into a balanced beer then Rumble is worth a try. Hoppy Boston score: 3.25/5.